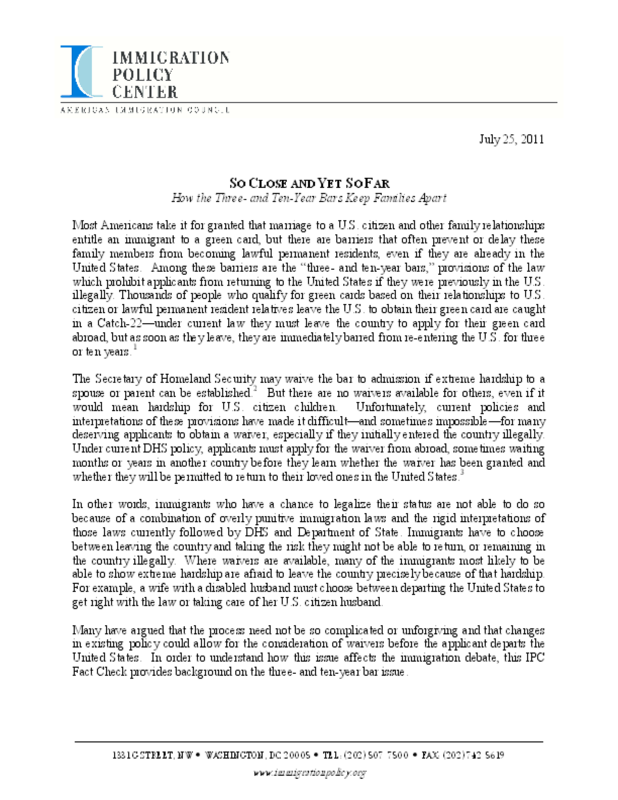 Most Americans take it for granted that marriage to a U.S. citizen and other family relationships entitle an immigrant to a green card, but there are barriers that often prevent or delay these family members from becoming lawful permanent residents, even if they are already in the United States. Among these barriers are the "three- and ten-year bars," provisions of the law which prohibit applicants from returning to the United States if they were previously in the U.S. illegally. Thousands of people who qualify for green cards based on their relationships to U.S. citizen or lawful permanent resident relatives leave the U.S. to obtain their green card are caught in a Catch-22 -- under current law they must leave the country to apply for their green card abroad, but as soon as they leave, they are immediately barred from re-entering the U.S. for three or ten years. The Secretary of Homeland Security may waive the bar to admission if extreme hardship to a spouse or parent can be established. But there are no waivers available for others, even if it would mean hardship for U.S. citizen children. Unfortunately, current policies and interpretations of these provisions have made it difficult -- and sometimes impossible -- for many deserving applicants to obtain a waiver, especially if they initially entered the country illegally. Under current DHS policy, applicants must apply for the waiver from abroad, sometimes waiting months or years in another country before they learn whether the waiver has been granted and whether they will be permitted to return to their loved ones in the United States. In other words, immigrants who have a chance to legalize their status are not able to do so because of a combination of overly punitive immigration laws and the rigid interpretations of those laws currently followed by DHS and Department of State. Immigrants have to choose between leaving the country and taking the risk they might not be able to return, or remaining in the country illegally. Where waivers are available, many of the immigrants most likely to be able to show extreme hardship are afraid to leave the country precisely because of that hardship. For example, a wife with a disabled husband must choose between departing the United States to get right with the law or taking care of her U.S. citizen husband. Many have argued that the process need not be so complicated or unforgiving and that changes in existing policy could allow for the consideration of waivers before the applicant departs the United States. In order to understand how this issue affects the immigration debate, this IPC Fact Check provides background on the three- and ten-year bar issue. Copyright 2011 Immigration Policy Center.